Citroën seem to be on a roll at the moment with its premium DS range. Not only do they look stylish, but the DS3 proves they can be good to drive too. The latest model in the range is the DS4, which is basically a premium version of the C4, a car I drove but was generally unimpressed with last year. Can the DS4 overcome the C4's problems? I spent a week with the range-topping £23,650 DSport 1.6 THP200. On first look, the exterior styling of the latest DS4 is a big step forward over the dull C4. 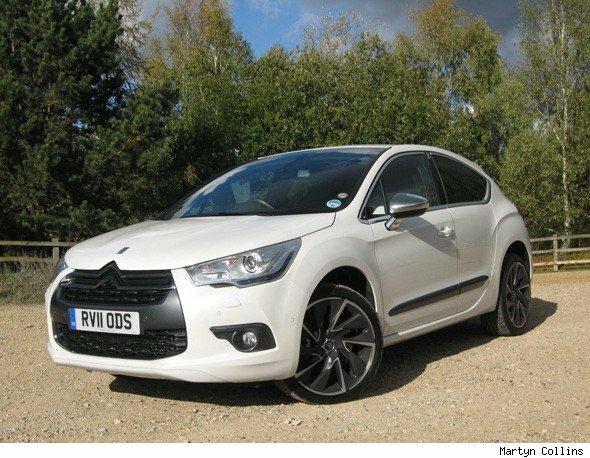 In fact, it's almost as though Citroen dumbed down the C4's styling to give the DS4 more impact. The first thing you spot is the more distinctive surface detailing around the arches and doors, then the plunging roof line and the Alfa Romeo-like hidden rear door handles. At the back there's also more interesting surface detailing for the bumper and rear lights. Finally, the DS4 sits higher off the ground. This is because unlike the C4, the latest premium Citroen isn't being sold as a conventional Astra or Focus replacement. Instead, it is being sold as a sort of hybrid, with elements of hatch, coupe and compact four-wheel drive. 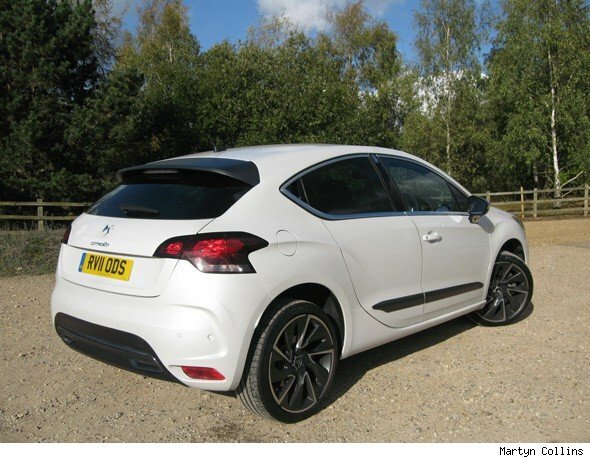 Our test car was fitted with the most powerful petrol engine for the DS4, the new 197bhp 1.6-litre which is shared with various other Peugeot and Citroen models. Despite being a torquey, powerful engine, emissions are just 149g/km which is the same as the lesser THP155 and the combined fuel consumption figure is 44.1 mpg, which I thought was pretty good considering the performance. With the 19-inch wheels and soft suspension, the ride is surprisingly supple and body roll kept well in check, but there are problems. Pot holes really unsettle the DS4, still there's plenty of grip.  Rear visibility is poor, because of the curvy rear quarters. The front windscreen pillars are quite thick too, but like the rear visibility, I suppose this is an example of design over functionality. Thankfully rear parking sensors are standard, although a set at the front would be welcome too. All DS4's are fitted with an electro-hydraulic system steering which is a big improvement, as it feels much weightier and sharper. Inside, the dashboard design is too similar to the C4's. The sweeping dashboard is made from good quality, soft touch plastic with metal touches picking out the air vents. 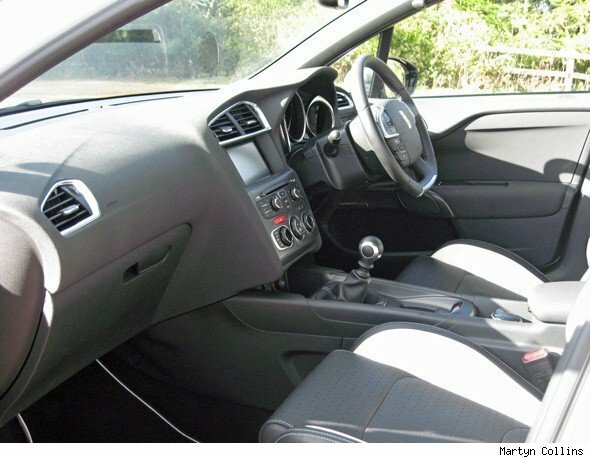 The centre console is dominated by the sat-nav screen but the stereo and ventilation controls are well sited. The optional white/black half leather trim and patterned door handle lift the cabin and make it feel far more expensive. The only thing I am not so keen on is the button-heavy steering wheel, which is difficult to operate on the move. The six-speed gearbox is reasonably slick and well-mated to this engine. Performance is capable, with 62mph coming up in 8.5 seconds and a top speed of 147mph. The DS4's driving position is quite different to the C4's, as the supportive seat is mounted higher and the suspension raised. Sadly, the rest of the DS4's cabin is a bit of a let down; rear legroom is tight and bizarrely the curvy tinted rear windows are sealed, making it feel claustrophobic. The lack of rear room might be disappointing, but the 359 litre boot is large for its class. 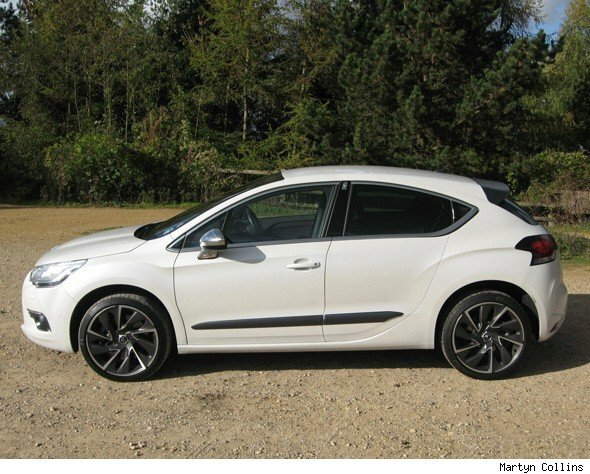 In DSport trim, the DS4 includes part leather-trimmed sports seats, CD player with six-speakers, automatic dual-zone air-conditioning, cruise control and an anti-theft alarm. Our test car was fitted with the optional EMyWay HiFi with navigation and JBL sound system (£1,190). The navigation maps are not very detailed, plus the controls are not easy to use. The JBL sound system is quite bassy and gives excellent sound reproduction. So to sum up, the DS4 solves many of the C4's shortcomings, I just wonder whether it is different enough to the C4 to justify the extra cost and I wish it was more fun to drive like the DS3.